"This is a bar cake similar to a brownie. 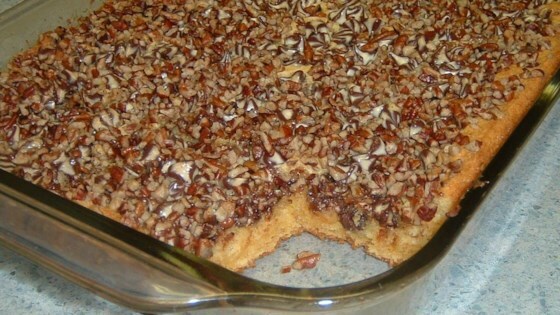 The butterscotch chips and walnuts sink into the cake giving it the appearance of a hornets nest." Prepare pudding as directed on box. Allow to cool slightly. Mix in yellow cake mix. Stir well. Pour batter into 9x13 cake pan. Sprinkle top with butterscotch chips and chopped walnuts. Bake in preheated oven for 35 to 40 minutes. Cut into squares and serve. I made this exactly as the recipe states. This was delicious. It was even better after being refrigerated. Great cake, looks and tastes good. Easy to make for last minute guests. This is a great cake! There is never any left over and I get requests all the time to make it. The best part is it is so easy! Give it a try!